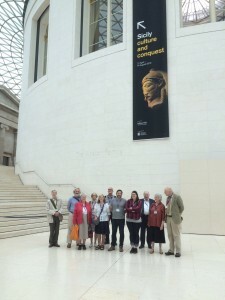 A selection of our members attended a tour of the British Museum’s acclaimed exhibition, ‘Sicily: Culture and Conquest’, led by the exhibition’s Curator, Dirk Booms, free of charge. This was followed by a an exceptional opportunity to examine medieval objects recently acquired under the Treasure Act, care of Dr Sue Brunning, Curator of Early Medieval Collections and SMA Council Member. This event provided a unique opportunity go behind the scenes of the British Museum and handle prized objects.